Tie-dye up to 36 shirts! Get everyone into this popular project! Dye shirts, socks, wall hangings and more. Easy to use and quick to clean-up. Bright, permanent color, professional results. 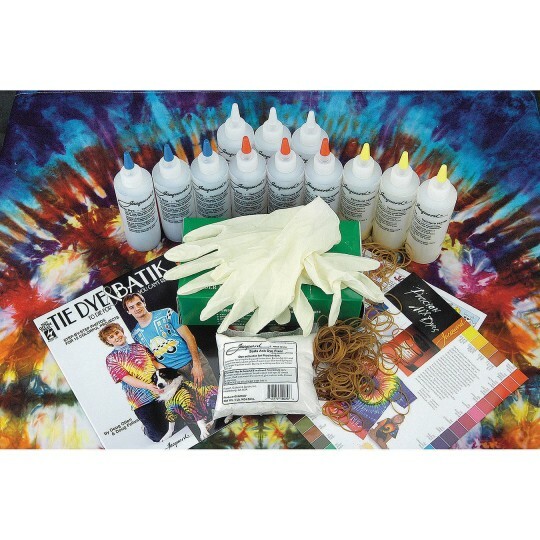 Dye kit includes turquoise, fuchsia and yellow dye in applicator bottles, fixer, gloves, rubber bands and instructions for 11 projects. Enough materials for approximately 36 shirts. we had a couple of groups use the kits this past summer. they had a blast making the tie-dye shirts and came up with some really awesome shirts. every summer we tie-dye something and the campers have fun coming up with their own unique designs. Need a lot of hands on deck for this project! We tie dyed about 36 T shirts for our nursing home residents so they could wear them for our 60's Day celebration and they were so excited. This gave the children a chance to be creative and bring their vision to life on the shirts. They enjoyed the end result.